Ryan William Vineyard at the Tasting Barn — Seneca Lake Restaurant, Winery & Tasting Room SERVING BRUNCH, LUNCH & DINNER. 100% estate-grown winery, specializing in dry red wine and European varietals. Live music & events. Ryan William Vineyard at the Tasting Barn is located on the Seneca Lake Wine Trail in the Finger Lakes (FLX) of central New York State, minutes from Watkins Glen, the town of Hector, and the village of Burdett. A short drive from Ithaca and Trumansburg, our wine tasting room -- known as the Tasting Barn -- is home to a restaurant and cafe, serving tapas-style snacks, brunch, lunch, dinner, local coffee, and fresh made-to-order farm-to-table (aka farm-to-fork) local food. We pair the highest quality wines from our own 100% estate-grown vineyard and winery, specializing in dry red wine and European varietals, including Chardonnay, Riesling, Pinot Noir, and Cabernet Franc. Also check our calendar for local dinner music & events! Our cafe offers a selection of locally sourced, farm-to-fork local food, coffee, and our 100% estate-grown wine. On and off-site catering available. Please contact us for further information, and to discuss all the options we can offer to fit your individual needs. The Tasting Barn on the eastern shore of Seneca Lake near Watkins Glen in the village of Burdett serves as the tasting room for Ryan William Vineyard, a 100% estate-grown and bottled (What does that mean? The winery owns the vineyard!) farm winery who’s vineyard and wine-making facility are located three miles north in Hector, New York. Tastings, flights, glasses, bottles, and food pairings of our varietal wines are all offered, which present you with the opportunity to taste wine from one of the highest quality growers and producers in the Finger Lakes region (FLX #FLXwine). 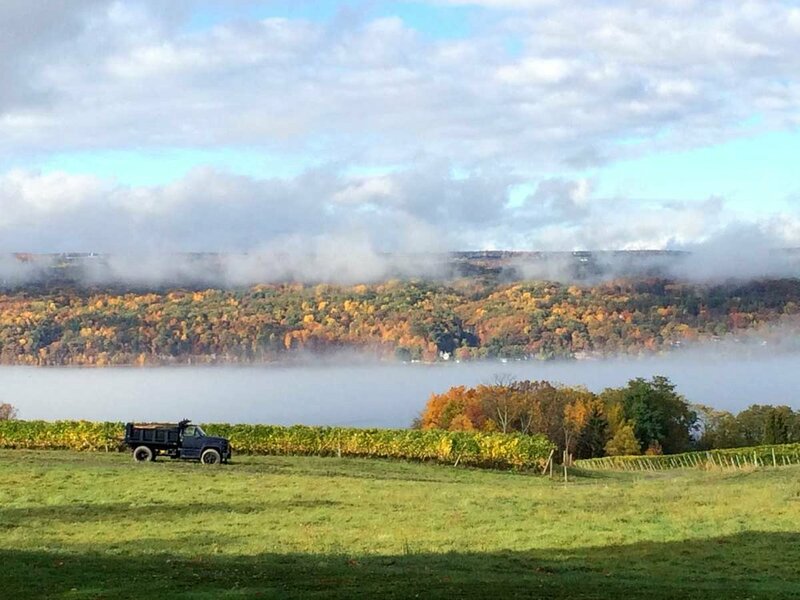 Located 25 mins from Ithaca, NY, and minutes from Trumansburg, NY, Ryan William Vineyard at the Tasting Barn is optimally situated in the heart of the Finger Lakes on the Seneca Lake Wine Trail. Because we specialize in dry red wine, you can expect to taste our Pinot Noir, Merlot, and Cabernet Franc (Cab Franc), but also to experience our signature white wines: Chardonnay, Grüner Veltliner, Gewürztraminer, and Riesling. Ryan William Vineyard at the Tasting Barn has fast become a place where Finger Lakes' locals look for music on the weekend. For live local music and shows near Watkins Glen, Ithaca, and Trumansburg, check our calendar below for events at our Tasting Barn venue. Our special events schedule includes local/regional bands and music artists, special brunch offerings, Wine Club releases, and wine-pairing dinners. Stay Tuned, More Events to Come! Located on the eastern shore of Seneca Lake in one of the Finger Lakes' most beautiful destinations, the Tasting Barn was initially designed as a Canted Queen Post Barn, used as a horse stable, and to store hay and grain. This original historic structure was built between 1865 and 1870, and was later modified in the 1950s to encompass a milking parlor. The barn was held in an estate for decades, and tragically fell into a state of disrepair. Luckily, the property was repurchased before the barn collapsed, and the framework was disassembled in 2014. Between 2015 and 2016, the original timber frame was restored and reassembled in its current location so as to become one of the great restored barns of New York State. Finally, this timeless structure, with its exposed, original timber frame, was opened to the public as the Tasting Barn in 2016. Want to discuss an upcoming event you'd like to have at the Tasting Barn? Questions about our wines, food, or menu? Send us a short inquiry with the form below.